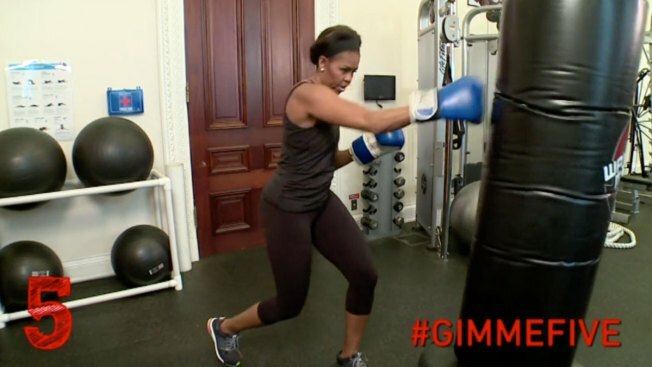 Five years after launching her Let’s Move campaign to fight childhood obesity, First Lady Michelle Obama released a short video on Twitter with five workout tips. In the video, Michelle starts with jumping rope and ends with hitting a punching bag and staying hydrated. FLOTUS’ video was posted in response to the president’s own five tips for the #GimmeFive Twitter campaign that is part of Let’s Move. President Barack Obama’s tips all include him wearing a suit, such as taking the stairs and having walking meetings instead of sit-down ones. No offense to the president, but his wife's tips are a bit more fierce.